3DiS Technologies is nominated for 3D InCites “Start-up of the Year” award. 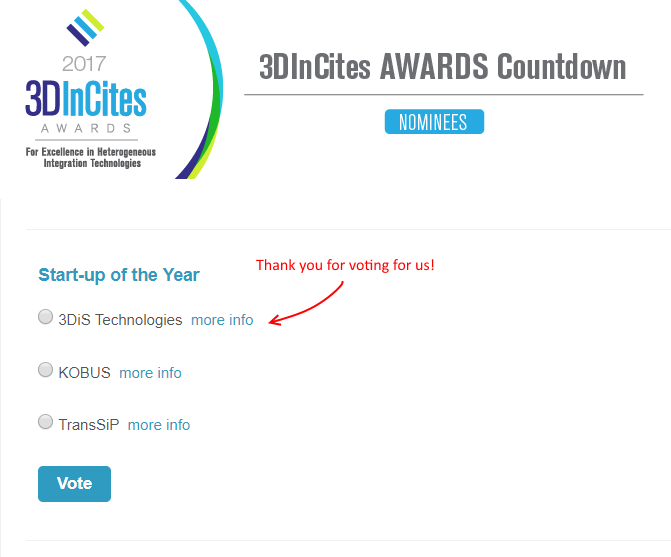 You are welcomed to connect to https://www.3dincites.com/3d-incites-awards/2017-3d-incites-awards-vote/ and vote for our start-up. You may vote one time in a 24 hour period. The 3D InCites Awards were established in 2013 to acknowledge companies who were instrumental in bringing interposer and 3D integration technologies to commercialization. Now in its fifth year, the scope of the 2017 3D InCites Awards has been expanded to include significant achievements in heterogeneous integration technology development. The 2017 3D InCites Awards will be presented on Wednesday, July 12, 2017, during a ceremony at the Impress Lounge, located above Moscone North, followed by a cocktail reception to benefit G1ve A Buck. Online voting closes July 6, 2017.